They say that babies don’t smile until they’re several weeks old. 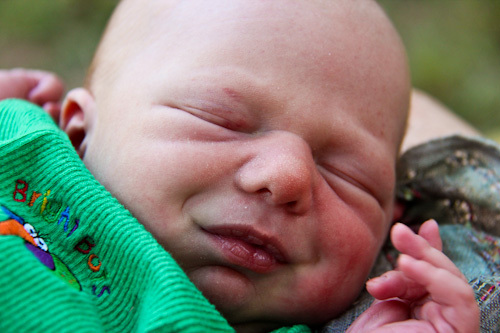 But clearly, Elijah is already smiling — albeit in his sleep. He's such a content little boy — even while he's dreaming! 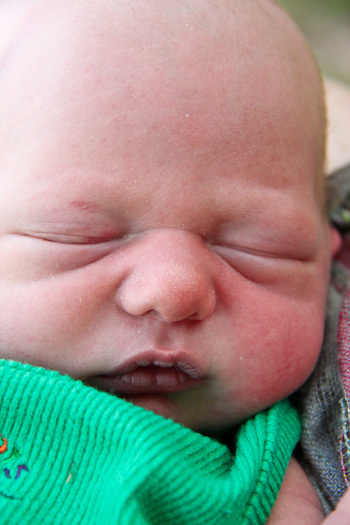 The milk blister has already started to form on his tiny lips. He's been breastfeeding really well and is already growing and changing. We’re still getting used to the masculine pronoun. Every one of us in the family has referred to Elijah as “girl”, “she”, “her” or “Delaney”. We’re still revelling in his presence and the novelty of having a son hasn’t yet worn off. Previously... Now we are seven! Lovely to see Elijah’s face up close… by the time we see you again he will have grown so much… we are blessed to see you via the net. a beautiful boy! Can’t wait to meet him!! Beautiful boy – can see some similarities with his siblings but he looks like a ‘boy’. Maybe its not a post for your blog but I’m curious about how you dealt with cutting his cord and clamping etc. and do you plan to have him checked over now that you are in town?